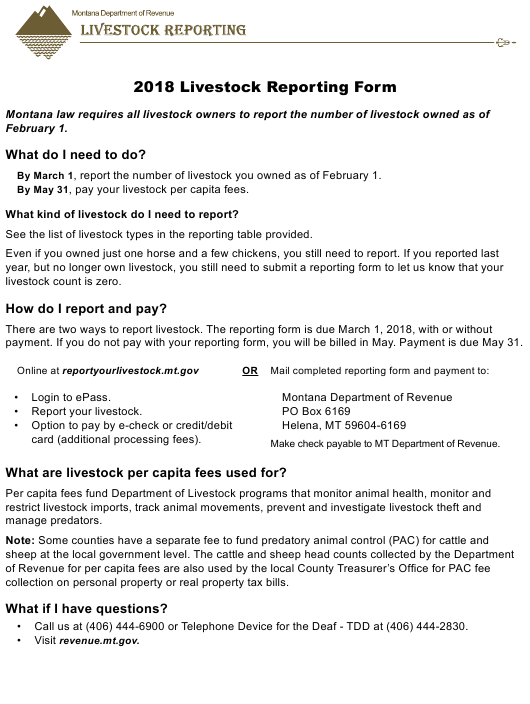 This printable "Livestock Reporting Form" is a document issued by the Montana Department of Revenue specifically for Montana residents. , report the number of livestock you owned as of February 1.
, pay your livestock per capita fees. What kind of livestock do I need to report? See the list of livestock types in the reporting table provided. How do I report and pay? payment. If you do not pay with your reporting form, you will be billed in May. Payment is due May 31. Make check payable to MT Department of Revenue. What are livestock per capita fees used for? collection on personal property or real property tax bills. Call us at (406) 444-6900 or Telephone Device for the Deaf - TDD at (406) 444-2830.
located on February 1, 2018. Make sure to indicate the county name on each table. older as of February 1, 2018. Add amounts in column C.
This is your total Per Capita Fee Amount due for this county. I affirm that the information provided in this reporting form is true, correct and complete. Reporting form is due March 1, 2018, with or without payment.